Using G-S Hypo cement, attach a 4mm peridot Swarovski flat back crystal to the center of a silver-plated 20mm round filigree component. Repeat to attach four 3mm peridot Swarovski flat back crystals in a square pattern 1/4 inch from the center flat back crystal. Repeat to attach eight 1.9mm peridot Swarovski flat back crystals, two on each spiral between the 3mm flat back crystals. Using a hot glue gun, place a small amount of hot glue on the inside of a second silver-plated 20mm round filigree component. 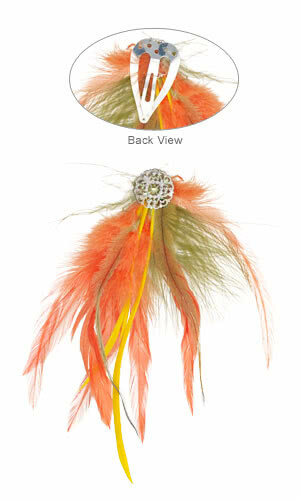 Press the top of seven orange chicken hackle feathers into the hot glue. Continue adding small amounts of hot glue to the inside of the filigree component, layering on two green turkey feathers, two green emu feathers and three yellow goose feathers. Using flush-cutters, cut one 15-inch length of silver-plated 28-gauge round wire. 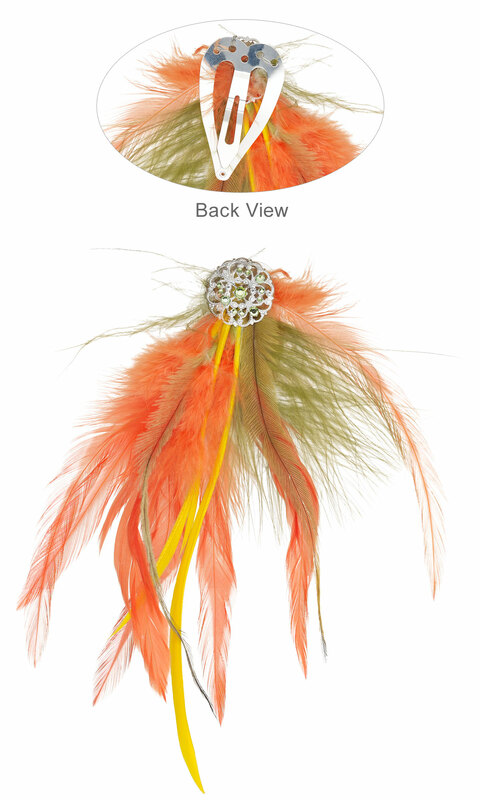 Using a pair of chain-nose pliers, pass the wire around the outer edge of the filigree component with the feathers and make two wraps to secure the wire in place. Place the crystal adorned filigree component on top of the filigree component with feathers, aligning the holes. Pass the wire through the top filigree component and back through the bottom filigree component until the two pieces are secured together. Position the back of the filigree components over the heart shaped hair clip. Pass the wire through the holes at the top of the hair clip and though the back filigree component. Continue to wrap the wire until the focal piece is secured to the hairclip. Tuck remaining wire inside the filigree components.